• For each minute a victim of sudden cardiac arrest is not receiving a shock from an AED, his chance of survival decreases by up to 10%. • The length of time from collapse to the first AED shock can dramatically influence a victim’s chance of survival. • AEDs are safe and easy to use. An Automated External Defibrillator (AED) is a critical device responsible for providing a shock to a victim’s heart after a fatal abnormal cardiac rhythm strikes the victim unconscious. 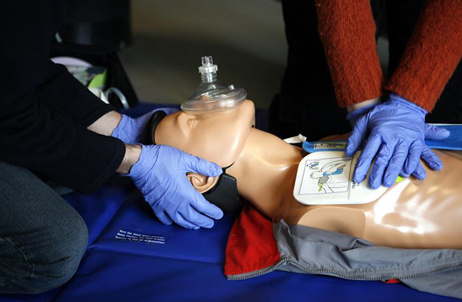 After sudden collapse, immediate CPR should be initiated until an AED can be applied. The optimal time from collapse to the first shock from an AED is less than four minutes. The GW Lifesavers Program offers Medical Direction and Program Oversight to both individuals and organizations. A physician from the Department of Emergency Medicine oversees all clients’ devices to ensure that they are working properly. This service includes an annual inspection of all AEDs, automatic reminders for expiring batteries and pads and access to an online tracking system to manage equipment. Should a GW Lifesavers client use an AED, the Medical Director will complete all required paperwork and reports to send to the state EMS agency. Some states, including the District of Columbia require every AED to be under the Medical Direction of a physician, and a prescription is required for purchase. These services are all provided by the GW Lifesavers Program. For any questions or concerns about the GW Lifesavers Program, please contact a Program Coordinator (mkrentsa@mfa.gwu.edu or 202.741.2958).